DJ was very courageous puppy. Lennox was a daughter of Pepper. At the age of 3 she died because of a nasty viral infection. Lennox was a brave little show- and coursing dog. Jet joined our family at the age of 4 years. After living in kennels she was grateful to live in out house. She was a very happy and loving dog. Ziggy was born to run. Racing was she ever wanted. She was a crack. Bowie was our coursingcrack. 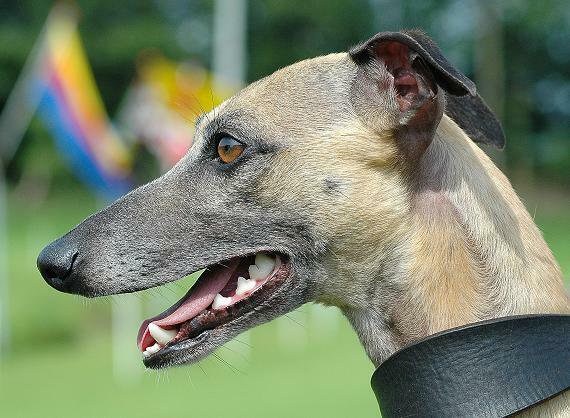 He was the first Dutch Coursing Champion. He was a sweet and gentle dog. Pepper was our first whippet. She had a mind of her own. She remained very beautifull to the end. The death of Pepper ends an era.This photograph has been taken ten years ago in Lostallo (Switzerland). The members of the Mythago pack in 1994 were (fltr) Jet, Bowie, Pepper, Lennox and Ziggy. Deli was a daughter of Ziggy. Deli was allways positive about live. Luna was a sweet and gentle dog. She loved the water. For others a character, for us a golden dog. Djati was a daughter of Ziggy. She had a strong character. Chelsea was een very strong dog. She guarded us till the end. Janse was a very happy dog. She had funny habits. Maartje was the mother of our whippets. Willow, man about the house. European coursing champion. Nova, suddenly she came into our lives, suddenly she disappeared. Soulmate.